To be honest, I’m just throwing in the Guerlain Rouge Automatique for confusion haha! The real comparison here is between Chanel Rouge Coco Shine and the new Dior Addict lipsticks, and which I prefer (which may not necessarily be the same as what you prefer). My comparison was based on packaging, texture, lasting power and price. My vote goes to Chanel on this one. I like the sleek simple packaging of the Chanel lipstick tubes. Always have, and probably always will. Dior’s futuristic looking tube looks a bit plain and bulkier whilst Guerlain’s just a tad gimmicky for me. Of the 3, the Chanel lipstick has the best heft and feels the most solid. Guerlain’s the lightest. Both Chanel Rouge Coco Shine and the new Dior Addict boast the same sort of texture. A lipbalm lipstick. Sheer colour that glides on the lips on with a balmy texture. Not sticky, not thick, not too stark. Both deliver on all counts. My choice however goes to Dior Addict because I prefer how it feels and how it looks. It glides on the lips yet imparts good colour intensity, which is mostly why I wear lipstick in the first place. The Chanel Rouge Coco Shine is more like a tinted lipbalm. The colour is very much sheerer and lighter. I swatched about 20 at the counter and found them all looking remarkably similar. The swatch comparison should tell all. 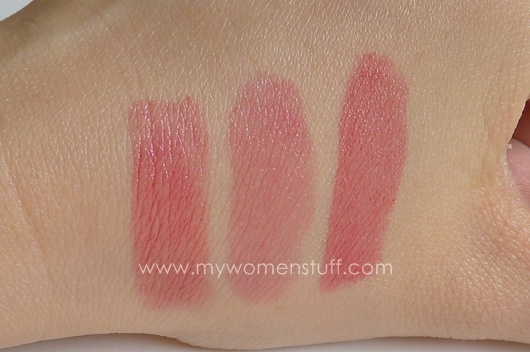 Swatched once, you can see how the intensity varies between the three different lipsticks. Swatched twice, the Chanel is noticeably lacking in colour. You might like that and if you do, Chanel will be your choice.You will also note that despite being layered, all three lipsticks still have a sheer texture to it and do not become opaque and thick. The Chanel is nice for a weekend or for when I don’t feel like looking like I have lipstick on. But for everyday, I prefer Dior Addict which may feel a bit stickier to some but which imparts a better variety of colour and intensity. Guerlain Rouge Automatique feels more like a lipstick. It glides on, but it is strongly pigmented so what you get is good colour in a light textured lipstick. It is, as I have noted in my review on the Rouge Automatique, a marriage between Chanel Rouge Coco Shine and Dior Addict if that’s what you might prefer. Guerlain Rouge Automatique outlasts the other two. If I don’t wipe it off after lunch, it’ll still be there and with minimal touch up, will look as good as new. Dior Addict has noticeable wear after about 4 hours with drinks in between. Chanel Rouge Coco Shine has the poorest lasting power of the trio. It barely takes me to lunch. As I have noted before, comparing Dior and Chanel, my preference lies with the Dior Addict lipstick. The colour selection is better, the colour intensity is good yet retaining the sheer lightweight texture of a lipbalm, it isn’t drying, and if you like, you could apply a light sheer colour with just 1 swipe, or up the ante by applying more layers. 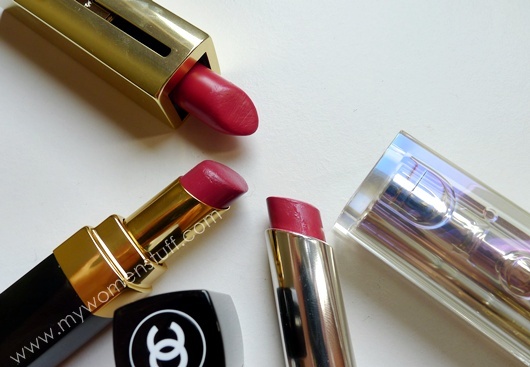 I also like the slant of the Chanel and Dior lipsticks vs the Guerlain one. Chanel and Dior are easier to apply. On overall terms, I’d go for Dior Addict, Guerlain Rouge Automatique and Chanel Rouge Coco Shine in that order. 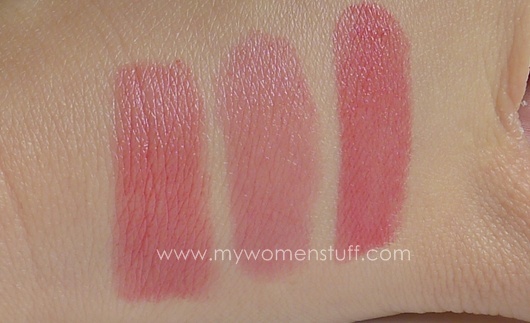 As for how either of these 3 lipsticks fare next to the Dior Serum de Rouge, I don’t think they are in the same league. Serum de Rouge is more like a lipstick than lipbalm in texture. It also hydrates and treats my lips if they are feeling dry, and feels quite different on. Its like Rouge Automatique with hydrating qualities. If you are considering a sheer lipstick, Serum de Rouge isn’t quite it. Dior Addict lipsticks retail at RM90, Chanel Rouge Coco Shine lipsticks retail at RM90, Guerlain Rouge Automatique lipsticks retail at RM114 at all their respective counters. Yes yes! Get the Dior Addict. 44 colours to choose from… you’d be spoilt for choice! And you can’t ask me k? I have such a soft spot for lippies its no longer funny. I have always loved Dior lippies and love them even more with this review 🙂 my next buy definitely be a dior addict no confusion whatsoever hehe. Glad you agree too Sue Lynn! I haven’t been checking out a lot of comparisons but there was so much love for Chanel Rouge Coco Shine! I love how lux it is, but texture-wise I think its just mostly tinted lipbalm 😛 I gotta agree with you re: Guerlain Rouge Automatique too. I’d love if they had put the formula in a regular tube because the formula is gorgeous! I do have to admit that I only like the new formulation of Dior Addicts. The previous High Shines () and Pure Colour did absolutely nothing for me! I only have the Dior Addict, but based on the reviews online, I don’t think that I’ll be getting the new Rouge Cocos, the old ones, perhaps. And the Rouge Automatiques!!! I’ve been walking past Guerlain KLCC for the past two days and I was dragging meself away to stop buying any of them, am lucky so far, teehee! Thanks for the informative post, PB! But they’re still cheaper then the Rouge G’s, yes? Well, it’s the “liaw” that’s more important mah, heh heh heh. I hope my aunt picks up a Chanel or a Dior Addict lippie for me while on vacation. Thanks for the comparison! I had a male coworker (who has no idea of my secret makeup obsession) say to me OMG I NEED TO SHOW YOU THE COOLEST LIPSTICK!!! He pulled out a magazine and rifled through the pages until he found a one page ad for the Automatique. OMG! That’s such a funny story!! But the fact it appeals to guys… what a great chat up line it would make! i like how all lipsticks are layered but still looking sheer. I played around with Aromatique but wasn’t impressed with the gimmicky packaging. If I want something gimmicky, I’d go for younger brands like UD or Stila 🙂 On the other hand, the packaging for Rouge G is so seriously lux that it’s ridiculous. I love Rouge G. Serious love. I love that with that hefty lippy in my handbag, I can easily brain someone with it LOL! I’d say my Dior Addict is seriously the best money spent on any makeup. I love the packaging the colour and the scent! Even though I’ve only tried Estee n Clarins as an alternative, I don’t think I can find the same magic elsewhere. Oops! You have expensive taste m’dear! Thank you for this post and to the many of you who shared about the Chanel lippies. I’m glad I didn’t give in and buy any as much as I love Chanel (newly convert btw). Will save my money and get a guerlain automatique. The reds are all calling out to me. Especially 122 liu and 123 Habit rouge etc. yes…rational…rational…I will drop by to check out the Automatique end of this month. Busy with work to go check out right now. From the photos, the automatique looks intriging and calls out to me! Yes! I’m however a bit disappointed now that i’ve read your reviews and some others that the packaging part is not all that fantastic in real life. Btw, sidetrack a bit, have u tried out Chanel’s Mat Lumiere Extreme Sebum Control Pore Minimizing Powder Foundation SPF20? Do go try out a sample. It’s great for our humid weather and if we’ve got some pores to cover. Yay! There was so much love for the Chanel shines out there that perhaps I just felt a little balance was in order haha! Next lipstick to try would definitely be a Dior Addict. I’ve already got a few shades that I’ve swatched and “have to get”. And since I’ve been a fan of Guerlain off late as well, I’ll be sure to add a Guerlain Automatique to my list of lemmings. 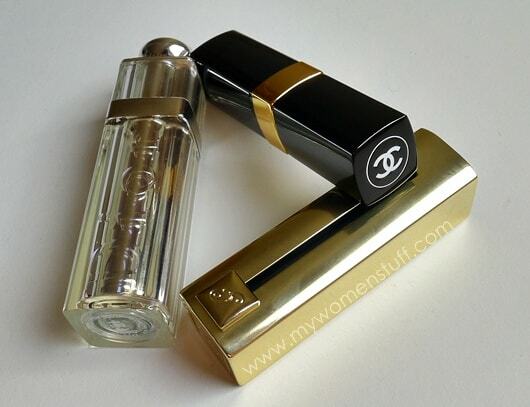 Just wondering if you have ever tried the Chanel ROUGE ALLURE LAQUE. I haven’t tried the Coco Shine or the Guerlain yet, but in terms of lipsticks, ROUGE ALLURE LAQUE definately gives you the most wear-time plus being heavily pigmented and lightweight. It is one of my most favourite lippies of all time. I do agree with you that the Dior lipsticks really work better than the Coco shine. Rouge Allure Laque is different in texture hence it isn’t featured here. The face off here is between the new sheer textured lipsticks that are making their appearance and the ones getting the most hype from the media. It might make an appearance in a different comparison some day.